Experience all that Deer Valley has to offer at this inviting slope-side ski chalet, complete with direct ski-in ski-out access, a private ski bridge, heated wrap-around decks and patio areas, two exterior fire pits, and stunning views of Lake Jordanelle. Featuring 13 536 square feet of indoor living space, the Dream Home offers six bedrooms, ten baths, two living areas, a gourmet kitchen with separate Butler's pantry, a luxe fitness center and a theater with stadium seating. Test your golf game on the FullSwing simulator, enjoy your favorite vintage from the cellar, relax in the heated swimming pool and over-sized hot tub, or rejuvenate in the steam room or sauna. 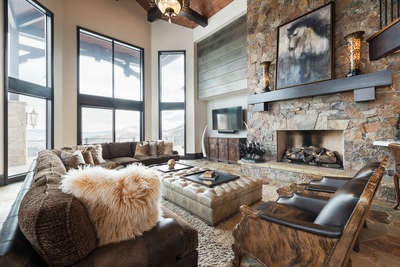 The Resorts West Ski Dream Home was constructed specifically to epitomize a skier's dream come true. The custom-built home features a ski-in bar, two wine cellars, a gourmet kitchen, heated three-car garage, heated swimming pool with grotto, oversized hot tub, 'chill room' with bar, custom DJ booth, pool table and FullSwing golf simulator. A 14-seat theatre features surround sound and stadium recliner seating. Outside, skiers can relax with two fire pits and 4 500 square feet of wrap-around deck space. 4 500 square feet of wraparound deck space. Recreational room with DJ booth, pool table and FullSwing golf simulator. 14-seat theatre with surround sound and recliner seating.